We should never forget that the ancestors of our domesticated dogs and cats were wild animals who were capable of looking after themselves very successfully. For centuries man has tamed and enjoyed the company of these animals for pure pleasure – 6,000 years ago the Egyptians regarded cats as sacred beings. Both cats and dogs have been used in working relationships for hunting and protection, for which the animals received food and shelter. These animals were free to run loose and lived a more or less natural life. Modern man still loves to have these two animals near him, but due to circumstances beyond his control, has altered the lifestyle of these animals so radically by confining them to small properties surrounded by high walls. They seldom run free to exercise properly, to eat grasses and fresh plants at will, or roll in dust and grass for the wellbeing of their skin and fur. This impacts on their health, state of nerves, digestive system and attitude. This can, however, be changed with the introduction of a few herbs into the life of these pets. Our dogs and cats need fresh plants for their general health. Fresh plants are rich in essential nutrients – mineral salts, natural vitamins and chlorophyll (the green substance in plants), These are all very necessary for general good health. Both these animals willingly eat grass when they can get it. Cats roll in and eat catnip and other mints. Dogs rub themselves through bushes and grass, and both love to lie under shrubs. Plants don’t have to be eaten to be of benefit. Their volatile oils are absorbed through the skin of the animal. Dogs and cats easily become constipated from the continuous and monotonous diet of dry pellets or kibbles that they are given day after day. Their diets need the addition of fresh plants for their fibre and roughage content. A small handful of crushed leaves and stalks of dried comfrey, dried spinach and dried rosemary can be sprinkled on the kibbles DAILY. The animal will lick up small amounts of the herbs while picking up the kibbles. This is sufficient to keep their digestive systems in good working order. Our pets should be fed some real meat at least once a week, preferably more often, if you can afford it. (Not tinned dog food, by the way!) Cook up a stew of some cheap minced meat or chicken with chopped herbs – comfrey, rosemary, thyme and parsley – plus chopped carrots, spinach, green beans and peas, and you will be surprised at how your animal’s health improves. A herbal infusion (tea) can be made from 1 teaspoonful of lavender, comfrey, catnip, rosemary, parsley and thyme to 4 cups boiling water. Allow to stand and then strain. Mix half a cup herbal infusion to 1 cup milk for the pet on a daily basis. The animals will be getting a good blend of healthy herbs, rich in mineral salts and phyto nutrients. These herbs, which you can grow in your garden at home, can be of value in improving the health of your dog or cat. 1. Rosemary: This small 1.5 – 2 metre square sized shrub is a pleasure in a garden. Plant it in a sunny place in well prepared and well drained soil. It makes a good border and can be pruned lightly regularly. The bushes will grow for many long years and need a sprinkling of compost with organic fertliser each winter. Do not over water. Dogs & cats love to rub against rosemary bushes – thus releasing its strong smelling essential oils on the coat of the animal. 2. Catnip & Cat mint: These strong smelling plants of the mint family are adored by cats. The fragrance of catnip can send a cat into a stupor, and they have been known to destroy these plants by continuously rolling in them or chewing them. Plant several patches of this pretty herb in your garden, keeping some plants under a mesh cover if you have a very persistent cat, so that the plants can have a chance to recover. This mint plant is not a heavy feeder like other mints, and only needs to be fed 4 times a year with a sprinkling of good organic fertiliser, mixed with sieved compost. It will die back if over watered. 3. 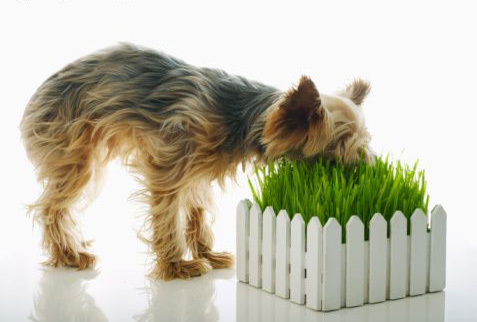 Dog grass: No garden should be without this herb for the dog to nibble on when it needs to. Plant a few clumps in different areas of the garden. Fertilise 4 times a year with organic fertiliser and water regularly. The clumps can be thinned out if necessary after a year or two. 4. Comfrey: A highly nutritious herb, high in Minerals and vitamins. One of the few herbs containing the essential amino acids for healthy growth and therefore a great source of plant protein for your animals. It is also beneficial for pets suffering with arthritic and joint conditions. 5. Cat grass: Cats and dogs love this grass. It grows in full sun and likes plenty of water and will benefit from a dose of organic fertiliser 4 times a year. Posted in Pets and tagged catmint, catnip, cats, dog grass, dogs, health, herbs, preperation, rosemary.